DT1 ... to take shape in Downtown Dubai. DT1, which broke ground earlier this year, has been designed to offer residents tailor-made luxury in one of Dubai’s most iconic locations, says Ellington Properties. Highlighted by its innovative design, DT1 presents residents with a distinct chic living space. It covers 20,000 sq m and rises to a height of 72 m. Its design and architecture have already won several awards including ‘Best Residential High-Rise’ at the ‘Middle East Architect Awards’ and ‘Best Architecture – Multiple Residence’ at the ‘Arabian Property Awards’. 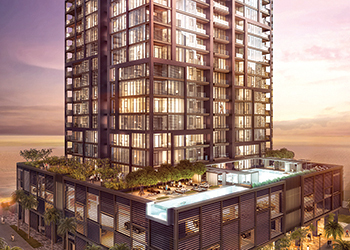 The project’s tower rests on a podium which features outstanding amenities and residences with private gardens. Large four-bedroom penthouses occupy the topmost floors. Integral to DT1 is the detailed build; the property’s bathrooms, for example, are of a modern design with quartz vanity countertops, integrated lighting, laminated wood and lacquer built-in joinery in addition to medicine cabinets. The living rooms and kitchen of each unit also have laminated and lacquer detail while the kitchen offers integrated Miele appliances, an under-mount kitchen sink and a dramatic mixer in addition to carefully crafted joinery details, says the developer. “With the city enhancing its reputation as a business and leisure hub, our objective is to present discerning customers with homes that meet and exceed their aspirations,” notes Thomas. DT1’s facilities have been chosen to inspire and enthral residents. The fitness centre promotes a healthy lifestyle and features state-of-the-art equipment, while the leisure and lap pools make for an invigorating work-out. For the family, an outstanding games room provides hours of enjoyment with several stimulating activities, says the Emirati developer. Finally, for art enthusiasts, the art gallery on the ground floor has a sun-drenched open terrace that brings in natural light. The reading patio, and outdoor and club lounge are perfect options for those seeking to unwind in the evenings, it adds. Since its inception in 2014, Ellington Properties has upheld its unique positioning as a boutique developer headquartered in Dubai. The company recently handed over its first project in Dubai – Belgravia – in Jumeirah Village Circle (JVC).